If you’re looking for a peaceful RV park in a community that has the laid back, retro feel of yesteryear with the conveniences of modern day and convenient location, then Silver Springs RV Park (formerly Silver Springs RV Park and Campers Garden) is the place for you. Silver Springs RV Park is an age-restricted 55+ community, while it attracts families in the summer given its proximity to the Silver Springs State Park and Ocala National Forest. We are located at 3151 N.E 56th Avenue, Silver Springs, Florida 34488 and 8.6 miles east of I-75. Silver Springs Boulevard is at exit 352 on I-75. The RV Park is located right across the street from one of the largest artisan springs in the world and Florida’s (the Sunshine State) first tourist attraction featuring the world-famous glass bottom boats. Silver Springs State Park is a beautiful composition of crystal clear waters, rock formations, aquatic plants, and Florida wildlife; a must see while you’re enjoying your stay at Silver Springs RV Park. 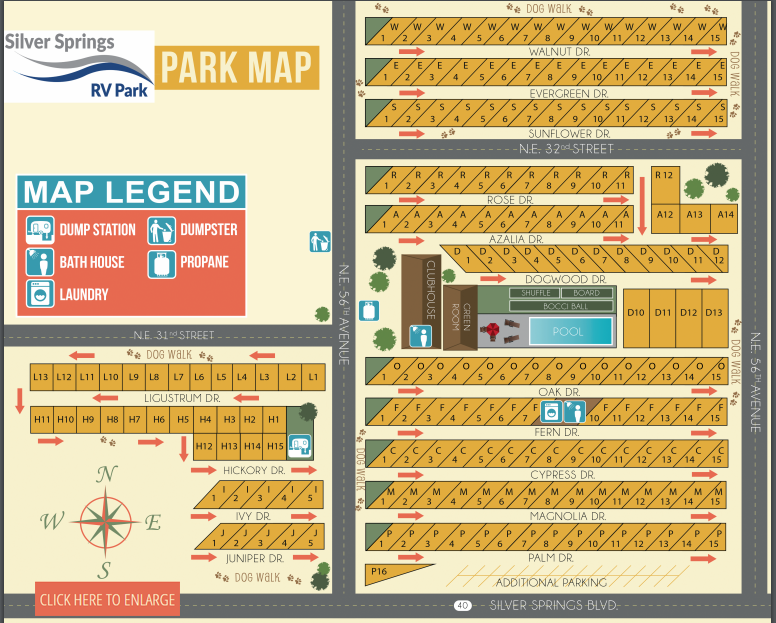 Why Choose Our RV Park/Campground? We feature 199 full hook-up sites, of which 196 are pull-through sites and 140 are with 50 amp service. These sites are all large, convenient, and surrounded by a perfect mix of tropical palm trees and live oak trees. This gorgeous landscape provides shade from the sun, while our heated pool, bocce ball, and shuffleboard courts are a great place to have fun with friends and a good place for family campsite. Our Game Room, better known as the Green Room, is easily accessible and lends itself easily to those individuals interested in cards, bingo, arts & crafts, etc. Our Management Team looks forward to planning a robust activities schedule for all to enjoy while at Silver Springs RV Park. 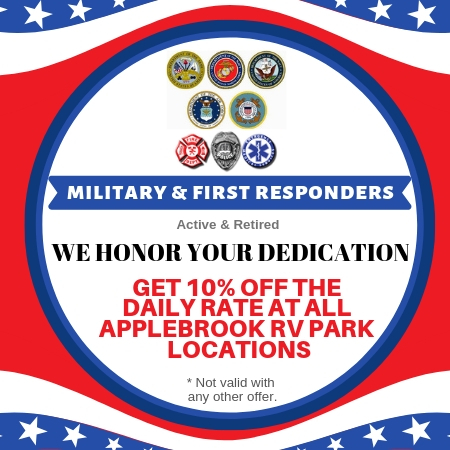 Silver Springs RV Park honors our brave military and first responder guests, active and retired, with a 10% discount on daily site rates.